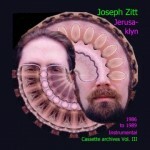 I’ve posted the tracks and art from one of my old CDs, Jerusaklyn, online at the Internet Archive. It’s a collection of instrumental tracks that I recorded in Brooklyn between 1986 and 1989 and released in 1999. So this is the grand tenth anniversary reissue. Or maybe the twentieth anniversary. Or something like that. This is rambunctious music, and benefits from loud listening (though some of the feedback solo on “Portable Face” may be a bit piercing). I played guitar, bass, keyboards, and drum machine on most tracks. “Theme by Rabbi Nachman” incorporates found vocals and other sounds that I recorded at the Western Wall in Jerusalem, including a madwoman who spoke of her visitation by the Prophet Elijah. Some tracks began as songs, but lost their vocals in the process. I recall that “The New Tax Laws and You” had a title and lyrics derived from a novel that I spotted in a gutter on Times Square, now (perhaps mercifully) forgotten. The current title came from a headline that was within sight when I needed to name the file. “Portable Face” had a vocal that tried to sound like Johnny Rotten but sounded a bit more like a rabid chipmunk. We’re better off knowing that that vocal, too, has been lost. Other tracks were overt tributes to favorite musicians. “Song for Charlie,” played on four tracks of acoustic guitar, was directly influenced by Charlie Haden. “Osaka” was influenced by Miles Davis’s double live albums Agharta and Pangaea, both of which were recorded on the same day in Osaka, Japan. I tried to put a band together in New York City in 1989 or so to play this music live, but it didn’t work out. I would still love to do it sometime. There are more liner notes at the site, where you can stream or download the album in a variety of formats.